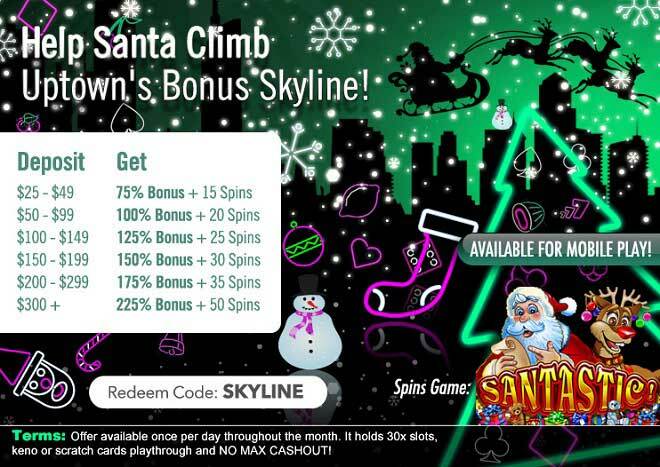 Help Santa Climb Uptown’s Bonus Skyline For 225% Xmas Bonus + 50 Free Spins! You better watch out, you better not cry, better not pout – there’s no reason to and I’m telling you why! Santa Claus is coming to town – and not just any town, Uptown! He’s climbing the Bonus Skyline and he’s not coming empty handed either: he will come down your chimney with up to a 225% Match and 50 Free Santastic Spins! The 3 reels and 5 paylines of Santastic will fill your Christmas time with cash multipliers with a value as much as 6x the normal prize. Land 3 of a kind and you’ll trigger the Festive Feast feature where two different bonus poles appear on each side of the screen and you’ll either collect 25 free spins or a 2500 prize! Santa will climb Uptown’s Bonus Skyline and he’s ready to take you with him towards a 225% Match plus 50 Free Spins!